Does a photograph show President Bush jogging with a serviceman who lost a leg in Afghanistan? 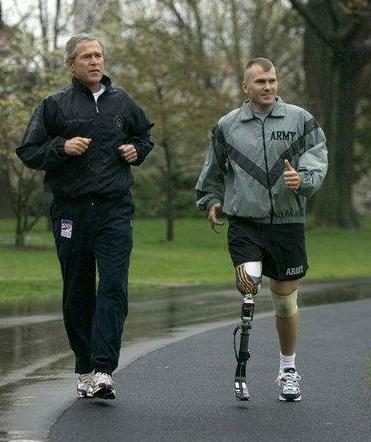 Claim: Photograph shows President Bush jogging with a serviceman who lost a leg in Afghanistan. Attached is a picture of Mike McNaughton. He stepped on a landmine in Afghanistan Christmas 2002. President Bush came to visit the wounded in the hospital. He told Mike that when he could run a mile, that they would go on a run together. True to his word, he called Mike every month or so to see how he was doing. Well, last week they went on the run, 1 mile with the president. Not something you’ll see in the news, but seeing the president taking the time to say thank you to the wounded and to give hope to one of my best friends was one of the greatest/best things I have seen in my life. It almost sounds like a corny email chain letter, but God bless him. middle and ring fingers of his right hand and a chunk of his left leg. Sgt. McNaughton was evacuated to Landstuhl Regional Medical Center in Germany for immediate treatment and later flown to Walter Reed Army Medical Center in Washington, D.C., for follow-on care. In the months since his wounding, Sgt. McNaughton has undergone at least 11 separate operations as a result of his injuries and has been fitted with a thin, robotic prosthetic shaft to replace his right leg. While recuperating at Walter Reed, Sgt. McNaughton was honored to receive a visit from President Bush. One of the subjects of common interest they discussed was running, and the President extended an invitation to Sgt. McNaughton to come running with him once he was up and about. The President’s invitation posed something of a dilemma for Sgt. McNaughton: “He said give him a call and we’ll go running. How are you supposed to just call the president?” Fortunately, Sgt. McNaughton’s doctor at Walter Reed was also a doctor for the President, and the two men were able to keep in touch through her. “It rained a little bit. I didn’t care if it was storming or lightning all around, I didn’t care. It was nice to run with him. “He has a weight room upstairs, in the White House. We worked out for about 45 minutes, we tried different equipment. He said I couldn’t do it, so I had to prove him wrong. Sergeant McNaughton says the president was more interested with his new leg than even his own children. McNaughton says the president couldn’t stop looking at it or asking questions about it. WBRZ-TV [Baton Rouge]. 5 August 2003.